Week 10 proved to be a great week for the team managers in Forto’s Fantasy Football. Nicole’s Qyainators and Russell’s Wildcats are battling for second place and the other teams are not far behind. As we turn into the home stretch some of the most popular (ie. point getters) are going down with injuries and causing the team managers to make trades at key positions like Quarterback and Running Back. Jinx: Fantasy super-star Vick and the supposed “Dream Team” this year are going down in flames. Their fourth quarter performances this year have all but sealed their fate in the NFC. Vick supposedly broke two ribs in the beginning series of the game Sunday and did not tell his coach about it until afterwards. Maybe that is the reason why he only earned me 10 points. Two of his star receivers earned the big GOOSE EGG. Jackson did not even play because he slept through at meeting and my guy, Maclin didn’t do anything. I have been saved week to week by breakout performances by Texans running back Arian Foster. Qyainators: With just eight points separating second from third place Nicole’s Qyainators are poised to make a run down the stretch. With one of the best one-two punches in the game with Brady and Welker, Nicole will be tough to beat. Her defense continues to put up huge numbers and with the annual turkey day game being played by her Cowboys she will head into the last quarter of the season on a high note (hopefully). Wildcats: Russell’s Wildcats are on fire! With a almost unheard of 30 point performance by his Chicago defense, the Wildcats are surely to give the Qyainators a running for second place bragging rights in the coming weeks. 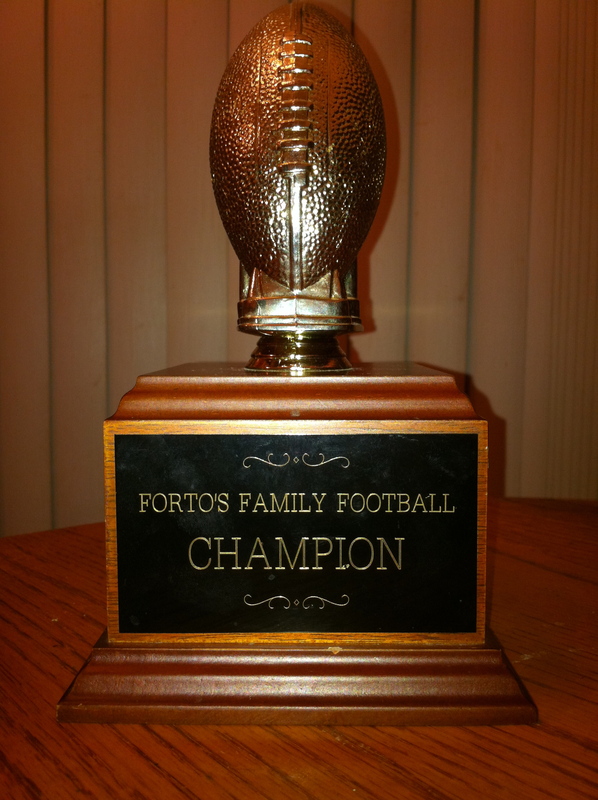 I am sure Russell would love to have his name engraved on the coveted Forto’s Fantasy Football trophy, too. Dreamchaser: Michele’s Dreamchaser put up a solid 85 point performance in Week 10 with great games by her QB, Brees and her two top wide receivers: Bryant and Nelson. It doesn’t hurt that her Kicker, the Bears Gould put up a 16 point performance this week against the Lions. Michele is not out of it yet! We still have 6 weeks of football left and anything can happen at anytime! Juneau: Tyler’s Juneau are in fifth place but that does not mean he is down and out. In a season plagued by injuries, Juneau is figuring out what it takes to play fantasy football. He did have a great Week 10 with his Tight End, the Patriots Gronkowski earning him a whopping 23 points! When you have Tom Brady throwing you the ball anything is possible! Chargers: Sadly we must report that Kyle and his Chargers team seem to look like they are no longer interested in playing in the league. He was having a very good year, often earning high points without even filling out his roster….